This lease is designed to lease large warehouse premises to the tenant. The space is located in a complex, and other tenants are present in portions of the complex. 1.6 Property: The parcel of real estate located in __________ County, __________, depicted on the Site Plan attached hereto as Exhibit "A" and legally described on Exhibit "B" attached hereto and incorporated herein by this reference, together with the office buildings now or hereafter situated thereon, the landscaping, parking facilities and all other improvements, rights and appurtenances thereto. 1.7 Building: Those two certain buildings known as __________________ and situated on the Property (collectively, "Building"). The Building has a stipulated total rentable space of approximately ____________square feet. 1.8 Leased Premises: Stipulated to be _________ rentable square feet, as outlined on the Floor Plan attached hereto as Exhibit "C". $___________ annually ($________ per month), based upon an rental rate of $_____ per rentable square foot per month, for months ___ through __. 2.1 Leased Premises. Landlord hereby leases to Tenant, and Tenant hereby leases and accepts the Leased Premises from Landlord upon the terms and conditions set forth in this Lease (including the Basic Provisions of Article 1 which are incorporated herein by this reference). Except as may be otherwise provided herein, Tenant shall have the nonexclusive right to use, in common with Landlord and others, the Building Common Areas. For the purposes of this Lease, the term "Building Common Areas" means common walkways and footpaths and landscaped areas, and such other areas adjacent to the Building which are subject to or are designed or intended solely for the common enjoyment, use and/or benefits of the tenants of the Building or other persons so designated by Landlord from time to time. Landlord may in its sole and absolute discretion freely modify, alter, eliminate, increase or decrease the Building Common Areas from time to time, provided, however, that Landlord shall not thereby adversely impair Tenant's access to or use of the Leased Premises. 2.2 Area of Leased Premises. Landlord and Tenant agree that the rentable area of the Leased Premises for all purposes under this Lease shall be the Rentable Area specified in Article 1.8 above. 3.1 Lease Term. The Lease Term shall begin on the Commencement Date and shall be for the period set forth in Article 1 above, unless sooner terminated in accordance with the further provisions of this Lease. The "Commencement Date" shall mean the later of: (a) _______________, or (b) the earlier of: (i) the day that Landlord shall obtain a certificate of occupancy for the Tenant Improvement Work (as such term is defined in the attached Exhibit "D") or (ii) the date that Landlord would have obtained a certificate of occupancy for the Tenant Improvement Work if not for Tenant Delays (as such term is defined in the attached Exhibit "D"); provided, however, that in the event that there shall be 10 days of Tenant Delay, then the Commencement Date shall be the first day after the 10th day of Tenant Delay. The Lease shall end on the last day of the ________th full calendar month following the Commencement Date. 3.2 Delay in Commencement Date. 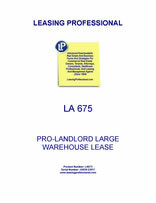 In the event Landlord is unable to tender possession of the Leased Premises to Tenant on the Scheduled Commencement Date, for whatever reason, Landlord shall not be liable for any loss or damage occasioned thereby and the validity of this Lease shall not be impaired, but Tenant shall have no obligation to pay Basic Rent or Additional Rent until the Commencement Date. Notwithstanding the foregoing, in the event Landlord should fail to deliver possession of the Leased Premises to Tenant by _____________, which date shall be extended due to Tenant Delays, Tenant shall have the option to terminate this Lease within 10 days thereafter by delivering written notice thereof to Landlord, and which termination shall be effective 30 days after delivery thereof to Landlord. 5.1 Payment of Basic Rent. Tenant shall pay to Landlord the Basic Rent set forth in Article 1.13 above, subject to increase as may be provided herein. The Basic Rent shall be paid in equal monthly installments, on or before the first day of each and every calendar month during the Lease Term, in advance, without notice or demand and without abatement, deduction or set-off (except as may be specifically provided herein). Basic Rent for the first full calendar month in which Basic Rent is payable shall be paid upon Tenant's execution of this Lease and Basic Rent for any partial month at the beginning of the Lease Term shall be paid on the Commencement Date. Basic Rent and Additional Rent for any partial month at the beginning of the Lease Term shall be prorated based on a 30-day month. All payments under this Lease shall be paid in lawful money of the United States of America to Landlord or its agent at the address set forth in Article 1 above, or to such other person or at such other place as Landlord may from time to time designate in writing.